Indu-Crete MT/UTC System — INDUE Industrial and Commercial Flooring Sales & Services, Inc.
Indu-Crete is our signature line of of polyurethane concrete coating products. Our MT/UTC system is a 3 part polyurethane system consisting of a base coat, non-skid aggregate, and top coat. Indu-Crete MT Base Coat: Troweled down at 1/4"-3/8" the MT base coat makes up the largest part of the floor. Designed specifically for food and beverage manufacturing industries this product exceeds in categories such as thermal shock and anti-microbial resistances. Indue Quartz (Non-Skid Broadcast Aggregate): Indue offers multiple different sizes of non-skid aggregates to fit the specific slip resistance and traffic needs of food and beverage manufacturing facilities. Our standard sizes are "A" grade and "S" grade. 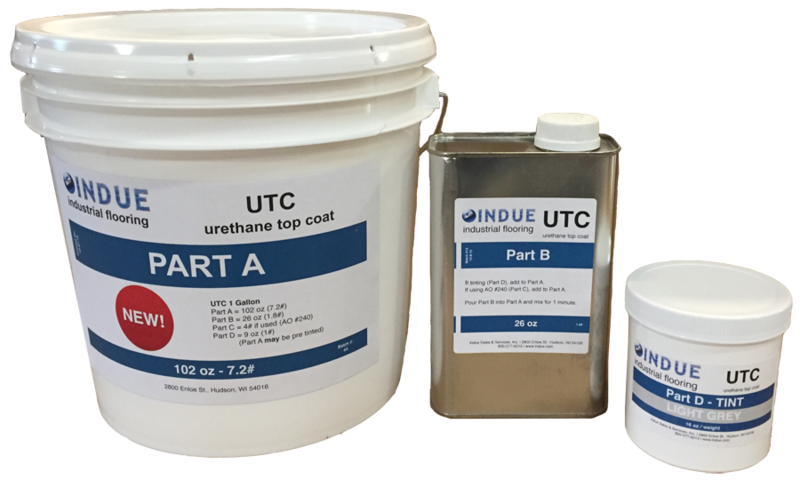 Indue UTC Top Coat: Our Urethane Top Coat not only strengthens the coating system as a whole but brings several other benefits with it. Indue UTC makes the floor easier to clean, helps maintain non-skid, and increases chemical and anti-microbial resistances. For 37 years Indue has worked specifically within the food and beverage manufacturing industry. Our MT/UTC system was developed specifically for these industries and to this day we continue to research and develop both new and current Indu-Crete products. With our specially trained crews Indue is fully equipped to handle industrial coating projects of any size. We have installed Indu-Crete in hundreds of food manufacturing facilities, including some of the largest plants all across the United States. We have a deep understanding of what it takes to get job done right in the harsh and fast-paced conditions of these facilities. From chemicals to thermal shock, food manufacturing floors often take heavy abuse. Our goal with the Indu-Crete MT/UTC system is to simply offer you the best flooring system available. Patching with Indu-Crete is done easy. At Indue we use a specific "keying-in"technique when we patch and repair floors with our MT/UTC systems. This allows us to tie into the existing floors and drains seamlessly. With every patch, from buckled coating to fading epoxy, we take our time evaluating every expectation that an industrial floor needs to meet in order to insure a quality installation. "A successful flooring repair or patching job starts with a thorough flooring evaluation. Every floor is different and we work tirelessly to ensure we move forward with only the best installation solutions for our customers."